Just months ago, I was googling “how to budget”. Now that I’ve worked out a system, I’m excited to share it! My brain capacity is better spent on pretty much anything but money stress, so knowing that I have a plan in place frees up so much space to focus on other things. 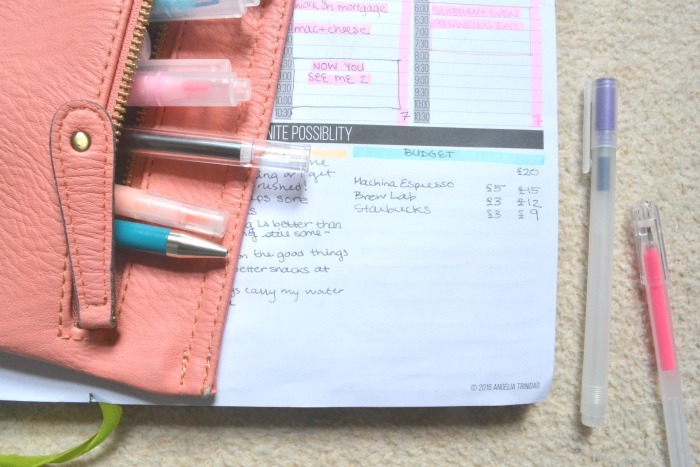 I love budgeting my time in my planner, so budgeting my money is a no brainer. 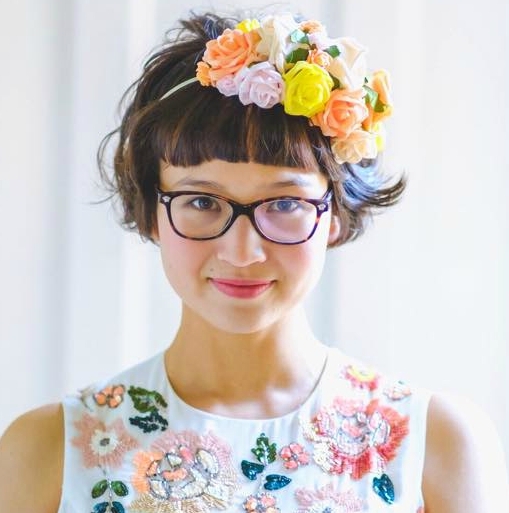 Sitting down to make a concentrated effort every week means that I no longer have a running train of thought worrying and wondering whether I can afford things. No more guiltily fearing to check my bank balance. Now I have a sense of how much I have, in every account, at all times. And it doesn’t even require that much effort. 1. Add income to spreadsheet. I highly recommend keeping a separate food budget, because well, food is important. Figure out how much you need on a weekly basis, and round up. This money can only be spent on essentials, which prevents me from having to make “books or food” decisions [because we all know who wins that debate…]. Our food budget also accounts for household necessities for cleaning, as well as stamps. For a while, Monkey and I were allocating savings first, then paying ourselves what was left over. This was kind of stressful. We’ve found an amount that we’re happy with as a minimum for our personal budgets, and now allocate that straight away. After allocating compulsory savings we decide how much of the surplus should go to other savings projects. We anticipate whatever little treats we can. If we’re going on a road trip for the weekend, we set aside money for fuel and food. Before the trip it is important to detail exactly what you’ve budgeted for, though – we’ve gone over-budget a few times by assuming! A note: at first I had no clue how much money we actually spent or needed for each category, but starting somewhere and adjusting the numbers at each check in has made me much more aware and in control. Our family budget meeting has proved so effective that I’ve started to do a personal one as well. I sit down at the beginning of the month and look at the numbers. It feels AMAZING to have a pretty accurate sense of exactly how much money I have and where. First, set a weekly allowance. How much do you need on a weekly basis to cover small expenses? After a bit of trial and error, I determined that £25 is a good budget for the day-to-day things I purchase, which is mostly coffee and teas at cafés, my price for a bit more luxurious productivity. I withdraw £20 in cash at the start of the week, and work with just that. the £5 stays on my bank card, and can be used towards purchases that I absolutely have to charge – but mostly I avoid paying by card, and knowing that I only have £5 a week to spend encourages that. Plus I like having a bit of a cushion so that if anything I have MORE money than I think. At the start of the month, I think up all expenses over £10 and set aside money for them. Evaluate your calendar for the month ahead. Are there any expected expenditures? Think events, movies you want to see, any presents you need to buy. Total up how much each costs. I prefer to purchase these right away. I book tickets, and order anything I need to online. For any pending purchases, I detail how much they will cost (overestimating, if I’m not sure) on a sticky note on my dashboard. My only recurring expense is Graze boxes, so I total how much they will cost me for the month and allow for that. Oh and I always have a £100 buffer at least on my bank card, just in case. I’m not a fan of paying overdraft fees, or having to worry about them! It helps me keep track of how much I’m spending where. Having it written down allows me to reflect on my purchases. One thing I’ve identified is that I usually regret getting coffee AND cake. One at a time is more of an indulgent treat, and more often than not I think I’m in the mood for cake more than I actually am. 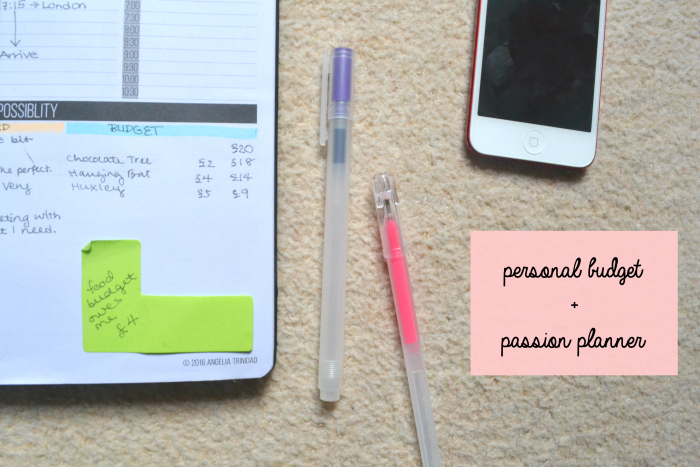 ^ Passion Planner budget! I keep it simple: description [of coffeeshop, most likely…], cost, updated balance. 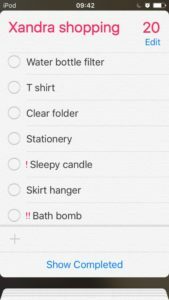 Keep a list – in one place – of things you need and want. For items that you replace when they are used up (like cosmetics), always have a backup ready to go (unless it’s better fresh). When you replace the empty bottle with the backup, add that item back on the shopping list to replace the backup. I use the Reminders app on my iPod for this. [GASP yes I am actually using technology for organising]. It’s portable and easy to access when I’m out and about. Each month, consult your shopping list. What do you need to buy this month? I decide what I need, and mark that item with an ! on the app. I look up the price and keep track on my dashboard sticky note. Anything that’s on the sticky note has been accounted for, so I pay for it by card. After all that, if there’s any left over it goes into savings, and if I’m feeling super organised, I plan for the months ahead. Last month I calculated expected expenses for this weekend’s trip to Oxford and London. I set aside half last month, and half this month. It was so much easier to budget that out, rather than worrying about whether I’d have enough! Right now I want to spend most of my surplus on Fringe tickets, but after that I’m saving up for a train ticket to London. Allocating categories to my savings encourages me to not spend the money rashly. Once it’s allocated, it is untouchable, because I have to ask myself if it’s worth sacrificing something that I really want in the long run. Also, I have to go in and transfer money around and that’s a faff. That’s my budget plan at the moment! Writing it out makes it seem a lot more complicated than it actually is, because really so much of this is automatic now that I’ve figured it out. 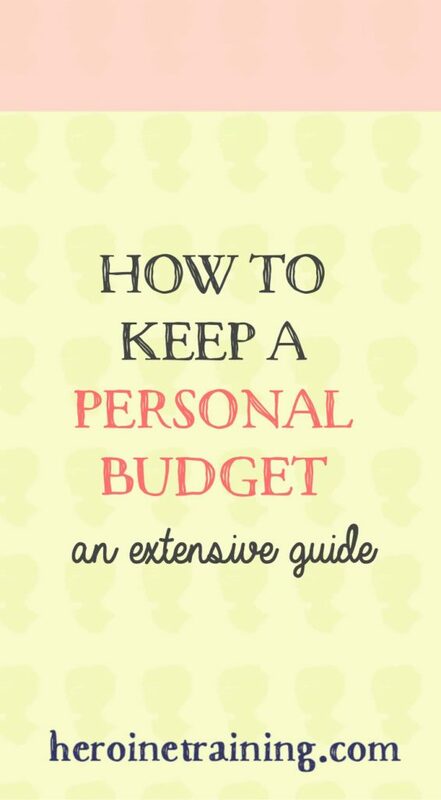 Do you keep a personal budget? 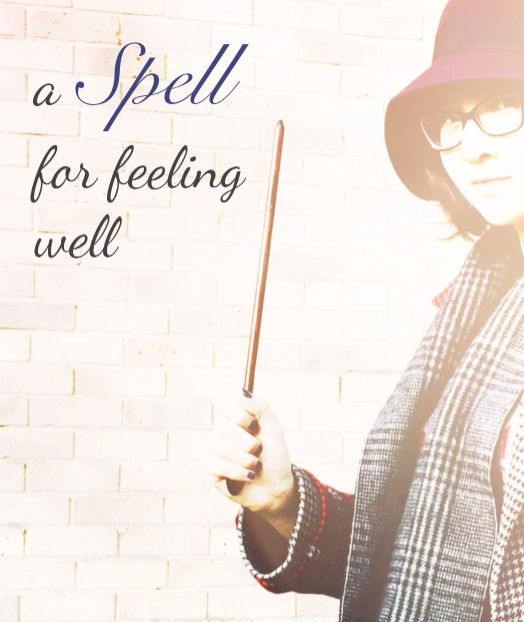 What helps you keep your finances organised and your mind free from stress? P.S. How to Make a Travel Budget – and stick to it!